The TMO in development group swear blind that there will be no privatisation. Do you believe them? We don't. Their promises cannot be believed because we do not know what might happen in future - especially in these troubled times. 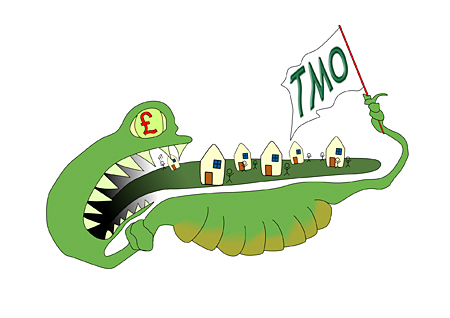 TMOs have been privatised all over the country and stock transferred to Housing Associations. If it can happen in Lambeth, it can certainly happen here. VOTE NO to the TMO to be safe. "Much has happened since our last newsletter which talked about the future of the estates, including a possible transfer of the ownership of the homes from the Council." "Description : The aim of this project is to facilitate the tenant led stock transfer of approximately 1100 council properties located on three estates managed by three tenant management organisations." "It is anticipated that the stock transfer proposal will be put to tenants to prepare for a ballot in February 2011. " Click here to go to the original document.